Giant Staircase in the Blue Mountains. One of the best bushwalks. Giant Staircase bushwalk loop Track, Blue Mountains. 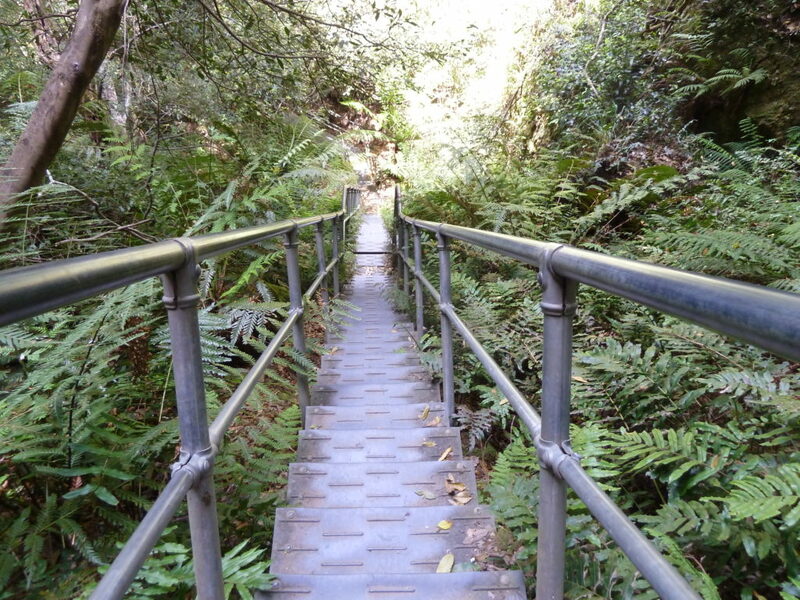 The Giant Staircase is one of the best buskwalks the Blue Mountains has to offer. Along with Wentworth Falls and the Grand Canyon Track. There are a variety of bushwalking loops you can take with the Giant Staircase hike. The Giant Staircase is also know as the 1000 steps. As you may have guessed, if you choose to do this walk be prepared to go down and up a lot of steps. All the different bushwalking circuits start with going past the 3 sisters then heading down the Giant Staircase, about 920 stairs. When you get to the bottom turn left onto Dardanelles Pass. Walk along Dardanelles Pass until you come across Leura Forest. This is an excellent place for lunch with a number of picnic tables in this area. When you’ve had something to eat keep going until you reach Marguerite cascades. Now it’s time to start making your way backup. Walk up along Marguerite cascades and this will lead you to Lila Falls. Head all the way to the top. This will lead to the Prince Henry Cliff walk. Now head back to Echo Point. The scenery is constantly changing on this 6km loop. You’ll need to have a bit of fitness about you. As mentioned there are a lot of stairs to negotiate. So don’t be fooled by the short distance of 6km. The trail head starts at Echo point lookout. There are a number of signposts around for the Giant Staircase walk to assist you with the bushwalk. As with option 1 go down the Giant Staircase. This time turn right onto Dardanelles Pass. Follow the track until you hit Federal Pass. Now you could go up the Furber Steps. When you get to the top follow the Prince Henry Cliff walk back to Echo Point. Or you can go a bit further and get the Scenic Railway back up and a cable car across. Directions to Echo Point, Blue Mountains. Google Maps Link. In google maps type in “Echo Point, Blue Mountains”. This will bring up Echo Point Lookout, Katoomba. The track starts just behind the Blue Mountains visitor centre. Follow the signs to the 2 sisters and Giant Staircase. Giant Staircase Blue Mountains Trail Map. Giant Staircase, Blue Mountains Photo Gallery. Blue Mountains, Giant Staircase, busk walk, bushwalk, trek, hike, hiking, trail, track, NSW, Australia, 1000 stairs. one thousand stairs.